A mini grey star print fabric decorates this delightful child rocker. 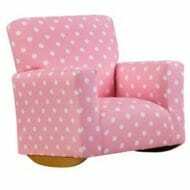 Comfortable and cute, this rocker features a wood-rocker base, plus side arms, and rocker motion restrictions to reduce the risk of tipping. Sized for kids up to age 7.